Learn about the different components of an ICF house. Fear, uncertainty and doubt rule the marketing campaigns of traditional builders. Fear of change, uncertainty about new products and doubt about the future. When your customers start seeing new ICF homes in the area and are interested in considering the technology as an option for their home they will often end up with half-truths and myths about the reality of insulating concrete forms. ICFs cost 3%-7% more on average compared to using traditional wood construction. This difference can be reduced by smaller HVAC requirements, energy-efficiency tax breaks and lower utility bills. 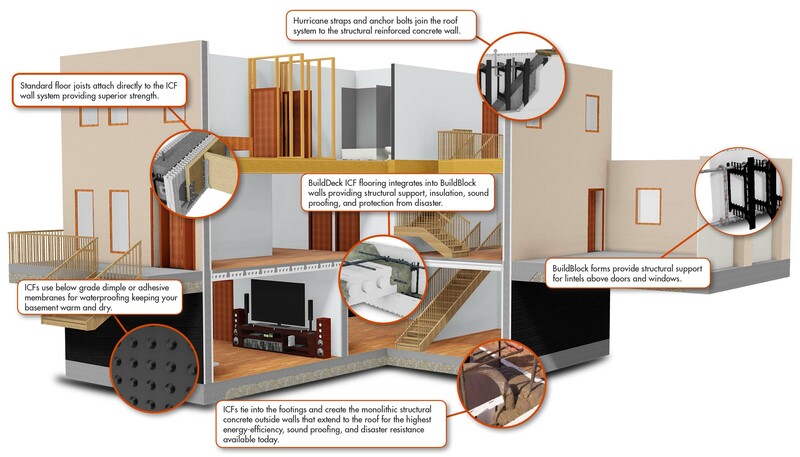 Building with ICFs is like any other technology. Make sure your ICF installer is well trained and is familiar with the product. ICFs in general are simple enough for DIY and even simpler than building with wood. Wood structures can be built with high energy-efficiency ratings, but they cannot achieve the same low level of air infiltration or thermal mass ICF walls provide. ICFs also resist natural disasters like fire, earthquakes, tornadoes, high winds and hurricanes unlike wood structures. This myth has been circulating for years in the media and has no basis in fact. Scientific testing at Texas Tech University and by FEMA proves that shelters built to FEMA guidelines are capable of easily withstanding an F5 Tornado. ICFs are excellent in all types of climates. They provide not only exceptional insulating value, but are safer, quieter and disaster resistant. ICFs are future-proofed for tomorrow’s building codes today. ICF homes look like any other home. Turn back to the front page of his newsletter to see for yourself or visit buildblock.com and look through the project galleries. The outside uses the same brick, rock, stucco or siding and the inside is even more inviting and comfortable. The only noticeable difference will be slightly deeper window sills and door jambs. Oh, and lower utility bills every month.